These instructions must be followed when assessing the student in this unit. The checklist on the following page is to be completed for each student. Please refer to separate mapping document for specific details relating to alignment of this task to the unit requirements. You have been assigned to manage an international marketing opportunity to take a popular domestic clothing brand into the foreign markets of South Korea, America and France. Formulating suggestions on how marketing activities could be affected in the future Present your plan as a portfolio. This must be done on MS word. 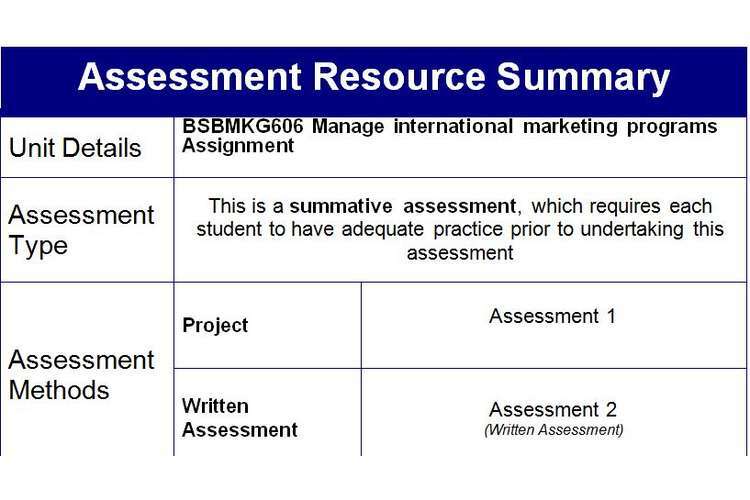 When you have completed the report, it is to be printed and submitted along with this assessment. Set a date for this written assessment. Advise students of the topic and how the assessment will be marked. Set ground rules including no phones, talking, books, etc. Allow time for reading and questions before commencing assessment. Once assessment has commenced, no communication between students is allowed. Remember – assessments are a participatory process, so you can help re-word questions, but be careful NOT TO LEAD. We are assessing the students, not you! In the event that a question is not answered correctly, discuss the response with the candidate to determine if the student did not know the answer, or did not understand the question. In order to achieve competency, all questions that are mapped in the associated mapping document MUST be answered correctly. What things do you need to consider when assessing a marketing opportunity for viability? What are SMART objectives? Explain. Give two examples of measurable objectives. What things do you need to consider when estimating what you can achieve in the international market? What are the advantages and disadvantages of the various types of marketing approaches? What considerations must you make before choosing an operational structure? What methods do you use to communicate international marketing objectives across your organisation? Why do you use these methods? What roles exist in a marketing effort? What responsibilities come with them? What are the different elements of the marketing mix? Choose three international markets and outline the cross-cultural communication and negotiation styles relevant to them. What steps might you need to take to manage the marketing effort to ensure it is directed towards areas of greatest potential for the organisation? Give some examples of promotional and sales activities. What monitoring processes can you use to keep track of the product, pricing and distribution policies in relation to market changes, objectives of marketing plan and organisational requirements? How can marketing metrics be used to measure success against performance targets? What is performance gap analysis and how can it be used to improve international marketing performance? What are market phenomena and how should you approach their analysis? What market phenomena have emerged in your industry in the past ten years? What effects have they had?